Last year we saw Samsung make some pretty bold moves starting with the Galaxy S6, not only when it came to its design language, but also in terms of software. Long criticized for being one of the more bloated OEM skins on the market, TouchWiz received a much needed slimdown in 2015. A year later, it seems to be LG’s turn. Alongside its own massive design language overall, the LG UI is making some pretty bold changes, all in the name of creating one the leanest and most simplistic versions of LG UI to date. The very first thing you will notice before even diving into the UI is that, when in standby, the LG G5’s display is never off. Officially dubbed as “always on display” mode, you’ll find that the time and a few notification icons will be ever present, making it easy to see the time and other relevant information at a glance. From within the settings, you’ll also find an option for adding a custom signature to the always on display, though only a limited number of characters are allowed. According to LG, the always on display is very power frugal, but for those who’d rather not use it, it’s worth noting that you can easily turn it off. Moving on, once you unlock your phone your eyes will likely be drawn immediately to what is the biggest and probably most controversial change found within the LG G5’s software. Yes, LG has ditched the app drawer. The official reasoning is that LG wants to create the “simplest kind of interface, and make it as intuitive as possible”, though whether removing the app drawer really helps that goal is certainly a matter of debate. For one thing, that means that all the apps will now reside on the homescreen, making users reliant on folders to keep things organized. As you might already know, we recently released an article reporting that Google itself is preparing to ditch the app drawer starting with Android N, at least according to two independent sources, and so it’s very possible that LG is just trying to get ahead of the curve. Regardless, the lack of an app drawer will be the most polarizing aspect when it comes to LG’s UI. Of course a 3rd party launcher will resolve much of the issue, but that doesn’t change the fact that the out of the box experience with the LG G5 is very different from stock Android in its current form. It’s not just the app drawer that’s getting the axe here. There are plenty of features from previous LG phones that are absent with the G5 including Q Slide applications. First introduced with the LG G2, Q Slides were small utility apps that could be launched quickly from the notification shade, designed to make your multitasking experience more pleasant. Speaking of multi-tasking, LG is also ditching dual-window support. You can still pin apps in the recent apps screens so they don’t get cleared out, but that’s about it when it comes to features designed with improved multi-tasking in mind. 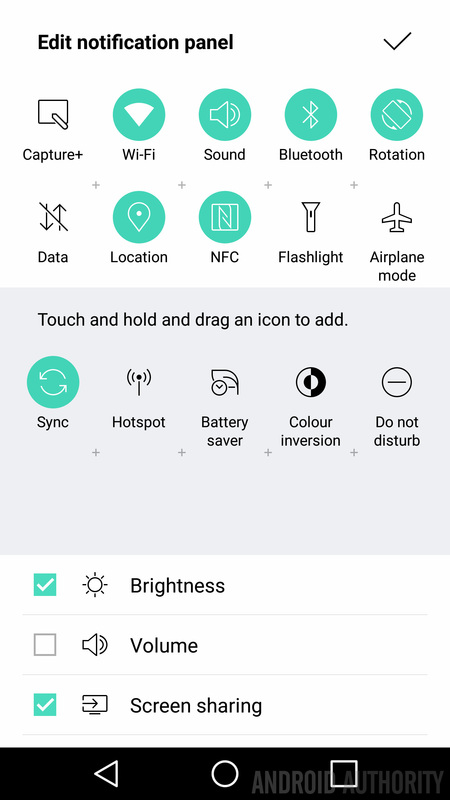 There are plenty of other minor tweaks and changes to be found here too, including reorganized settings, cleaner and more minimalist settings icons, and less bloatware overall. LG didn’t remove all its extras however, as well received features like Knock On and Knock Code are still present, as are tools like Smart Bulletin and LG’s Smart Cleaning, which identifies apps and other files that you don’t use in order to help you free up more space on your device. At the end of the day, the lack of the app drawer might be a deal breaker for some, though LG says that after a lot of market research they believe this is a more simplistic user interface a lot of people really want. Are you one of those people, or do you feel that LG misteped with the changes introduced in LG G5’s UX? Let us know your thoughts in the comments, and be sure to stay tuned for more great LG G5 coverage and all the latest from MWC 2016.